The rapid roll-up door is an ideal solution for quick and continual transits. Both models of roll-up doors can be provided with counterweights for an automatic opening in case of black out. All the roll-up doors can be supplied with transparent sections made in PVC type cristall and in particular with full door clear opening width transparent areas to get high brightness. This kind of rapid doors consists in a u-shaped frame, made in galvanized steel, suited to contain the sliding of the curtain, and in an upper roller to wind the curtain. All our roll-up doors are controlled by a control board (power supply 380 V three-phase) and are intended for an intensive and non-stop use. Within the range of special rapid roll-up doors we are able to work out on request doors with high level of insulation by using insulated cloths. 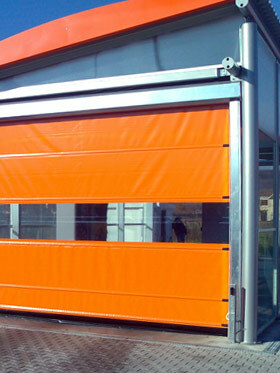 The maximum sized flexible roll-up doors are 8 m wide and 7 m high, windload up to 60 km/h .